Phil Gramm and I have a couple of things in common. We both lived in Georgia, 100+ miles south of Atlanta to be precise, for well over a decade. We both are University of Georgia alums. I went the Poli Sci route and Gramm became an Econ Ph.D.
We were both Georgia Democrats. We both left Georgia for Texas. He's a Baptist. I'm a Baptist. 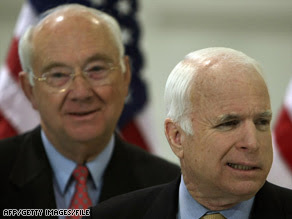 Gramm is now a top adviser to John McCain - a top economic adviser to John McCain. You've heard of mental depression; this is a mental recession...We have sort of become a nation of whiners, you just hear this constant whining, complaining about a loss of competitiveness, America in decline...We've never been more dominant; we've never had more natural advantages than we have today." I'm just wondering whether Gramm has checked the status of his Portfolio lately. My "low risk" Portfolio has been tanking, little by little, each day. It's somewhat unbearable. Up a few Benjamins at close Monday and Down a few months rent by Wednesday. Painful. So Pardon Me Phil Gramm while I whine and complain just a bit! And I didn't even lose my home or my job to a crappy economy. “What John McCain, George Bush, Phil Gramm just don't understand is that the American people aren't whining about the state of the economy; they are suffering under the weight of it — the weight of eight years of Bush-enomics that John McCain and Phil Gramm have vowed to continue. It remains to be seen just how far that distance between McCain and Gramm remains. They are good friends, you know. I think Gramm's statements demonstrate just how far behind the voters that he is. He still thinks the Republicans rule, and everyone will listen closely to what he says. Of course he blamed the bad economy on the usual Republican whipping boy, the media. Let me correct Karen, the DNC lady: We Americans are suffering under the weight of two years of Democrats controlling Congress, not eight years of Bush-economics. Big Daddy Weave and Cat's Dad, we've been suffering not for eight years of Bush economics, nor two years of democrats controlling congress. The very prevalent recession we are now experiencing is the result of 95 years of the unconstitutional Federal Reserve System, which has abolished the soundness of our currency and driven up inflation in order to bail out private corporations. Let's not be so simple minded as to blame this economic crisis on the Bush Administration or the Democrat-controlled Congress. All of the problems our economy faces now can be traced back to the fact that private, unelected officials are controlling our currency. This recession has been a long time coming. If we had only listened to the wisdom of Lev. 19:35-36. Gramm has hurt McCain's campaign--which was already in trouble. Did you notice that McCain's blue collar Michigan audience on Fri was SILENT--giving ZERO APPLAUSE? Obama's lead in MI (and OH) has been very soft and McCain could have caught him--but now I doubt it. McCain's "Gramm doesn't speak for me" claim is fooling no one--because just 2 weeks ago he was bragging about how Gramm had written most of his economic platform! From what I understand a recession is when our economy has negative growth for two consecutive quarters. According to what I have seen, that has not happened, yet. Is our economy on the ropes? Yeah it is, but it is still plugging along in positive territory. What is hurting us is energy prices, and many democrats who are leaders in our country are happy about that. We have had many opportunities to head off what we are experiencing now with energy prices, but our leaders in congress on both sides have coward to liberal groups and have not allowed refineries to be built, or renewable energy to be developed. This economy is a result of both sides not having the guts to do what needed to be done 20-30 years ago. Not for a moment do I believe that the people are justified in all their whining. While I almost always disagree with Phil Gramm on a variety of issues...this time the TEXAN was absolutely right.